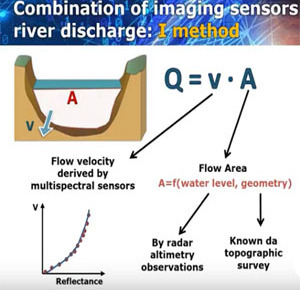 A second Youtube video that we have prepared for the ESA Phi-Week (12-16 November) showing how to estimate River discharge from space. Satellite data from altimeter and optical sensors are combined to monitor the flow of the river also for ungauged or poorly gauged basins. The proposed approaches can be useful for water resource management, flood forecasting and for hydraulic risk mitigation.